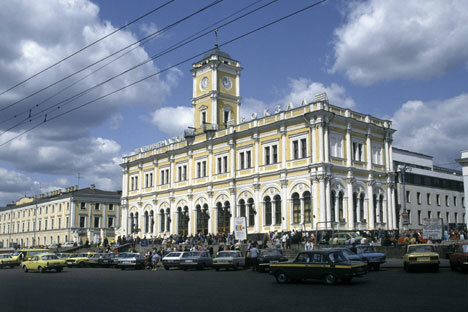 Reconstruction of Moscow's Leningradsky Station will be completed in the first half of 2013. Designers hope to make the busy station more serviceable, while preserving the historic integrity of the building. The station’s interiors will be restored, a food court and shops will be opened, and passenger service systems will be upgraded. View the gallery: "Russian Railways turns 175"
Dmitry Pisarenko, head of the communications department of Russian Railways’ Directorate of Railway Stations, told RBTH that the unique style of the interiors will be restored during renovation. “The station’s stucco ceilings and the historic décor of the royal chambers will soon look the same as they did in the 19th century,” said Pisarenko. Boris Uborevich-Borovsky, head of UB.Design Architects, believes that restoring the station’s interiors is a worthy project. “Right now, we are seeing Russia’s historic heritage being reconstructed on a large scale. And, in this case, no other alternative could even be considered, since the original station is a listed building,” Uborevich-Borovsky said. “It’s important to bear in mind that Leningradsky Station was built as part of the ensemble of the neighboring Yaroslavsky and Kazansky stations. It was also built to match the architectural concept of Moskovsky Station in St. Petersburg. This renovation project will be a success if it can preserve the integrity of this ensemble while bringing a new level of functionality to the old premises,” he said. Leningradsky Station will not just be rebuilt: it will also be expanded and modernized. A large supermarket will soon open on the mezzanine level; a food court will operate in the ground-floor foyer; the upper floor will house the ticket desks, waiting rooms and a shopping area. The rebuilt station will boast two additional stories – even the roof area of the station will be converted into usable space featuring an open-air restaurant. New information services for passengers will form a major element of Leningradsky Station’s renovation, as well. According to Pisarenko, the upgraded station will feature additional signs to help passengers find their way around the expanded areas of the building. All new signs will be posted in both Russian and English.